On 15th June Loesje poster-writing workshop was organized by Xchange Scotland in Glasgow. The meeting was funny, creative and productive. After Workshop we had great posters and lots of laugh. thanks to John, Martin and others for creative afternoon. There is an active Loesje group in Glasgow and they sent us Loesje Scottish Posters. Thanks to Martin Aliva and his friends for the Posters. 1) What does Loesje want and what does Loesje do? Loesje want to conquer the world with creativity and posters. This might sounds pretty abstract but beneath you can read more concrete about Loesje and her way of working. The texts published on posters reflect often the current world issues and the concerns and engagement of the Loesje member's world wide. The texts come from all over the world and after editing a series gets published. These texts have as aim to let the reader think, act and react on the topic the texts are referring to. Loesje tries to do this in a positive way and often avoids being moralistic and dogmatic. Some texts have a serious message and other texts are simply to make you laugh. Humor and creativity are always important in all work Loesje does. Texts on posters Loesje considers as a strong medium to reach people and can for example also be used in an information campaign to make people aware of the dangers of racism or the importance of environmental care. At the same time Loesje believes that you shouldn't make these topics to heavy and that's why she uses humor. The main mean Loesje uses are texts on posters. Loesje calls this an artistic mean. Artistic means (media and arts) are tools for personal, cultural and social development. Examples of artistic means are the usage of creative text writing, photography, theatre, video and music. In first instance you don't use them to make highly artistic productions but you use it as a tool, to think, react and act on a specific topic. In most activities Loesje involves these artistic means since they challenge people to be creative and to take another approach than the usual. Loesje started to work with more artistic means than the texts on posters, though the texts on posters will stay the most important way for Loesje to express herself. Loesje doesn't focus on 1 area since there are too many important issues in the world to say something about. Loesje is active in many developing democracies where (young) people use the Loesje texts to promote freedom of speech and to increase their countries democracy in a subtle and positive way. An example of an international project connected to human rights is the book in 1 day project where over 500 young people in 28 countries joined. Workshop connected to press freedom where given and the results where combined in 1 book that was created in 1 day, world press freedom day. Loesje is active in over 25 countries in the world and organizes several times a year international exchanges. During these exchanges people come in contact with foreign cultures and cooperate with each other. These exchanges contribute to better understanding of each other and more tolerance and that's essential to create peace and to fight racism and xenophobia. Another example is that at Loesje's international office people from over 5 nationalities work. The world is changing and that will always be so but some changes you prefer to avoid especially when it comes to climate change. Loesje often writes about environmental protection since this is a concern of most people active inside Loesje. Loesje latest project connected to this is the 'keep on traveling' project to reduce greenhouse gasses on European level. On www.keep.loesje.org you can find more information. International development exists out of many issues but at this moment Loesje is mainly focusing on the 8 Millennium Development Goals to fight poverty. In practice Loesje will do this by developing information campaigns with young people from Asia and Europe and to create a handbook with practical examples on these campaigns for other people to inspire them and to take action. Loesje is not just about the big world issues but also about personal issues and about what is happening in our close surrounding. That's also why there are many local groups that write about issues playing in their city and society. Most people active inside Loesje are volunteers. By organizing and participating in activities they gain valuable skills and knowledge that are often useful for future work. For example many Loesje members learn how to give creative text writing workshops to organizations and by that how to activate a group and to lead a creative process. Another example is that Loesje gives opportunities to her members to live for a year abroad and to work for another cultural/social organization. 2) How is Loesje organised? Loesje exists out of individuals, local groups and national associations. There is an international foundation that works as an umbrella organization and gives support to all people engaged in Loesje activities world wide. In principle all groups work autonomous but are connected and in touch with each other. They meet during international meetings and discuss activities that they have been doing and want to do. Loesje is informal organized and has a so called flat organisational structure and is run by personal initiative and motivation of volunteers and employees. Loesje members and groups get every opportunity to realise their ideas. 3) How can I start a Loesje group? # Step 1; Start spreading some posters and make your friends enthusiastic for the whole idea. In the beginning it can be handy to translate some texts from the international poster archive in your native language. At any time you can contact the international office for questions or support. # Step 2; If you have some enthusiastic people, you can start to write texts, 5 people is already enough. You can make an announcement so that other people might join. There is a small booklet with information in it on how you can give a text-writing workshop. # Step 3; Contact the international Loesje office who can layout the texts for you either you can layout them yourself. # Step 4; Spread the new texts and be sure there is some contact information on the posters. So that people who see the posters can mail you and who knows join you. # Step 5; You already have your own local Loesje group. You can repeat these steps, but of course there are other steps for more advanced Loesje groups. # Step 6; Create your own website, either ask the international office to help you making it. Website space is available for free and you can have your onw sub-domain for example for Latvia: www.lv.loesje.org With the website, you can reach more people, people can write texts online, you can publish your posters and make anouncements for text writings. # Step 7; You can start giving creative text writing workshops to other organisations. Cooperation if often a good thing to do. With this you can show to more people what Loesje does and you can also earn some money to finance your Loesje activities. Are there any more steps? Sure there are, but for now this should be enough. 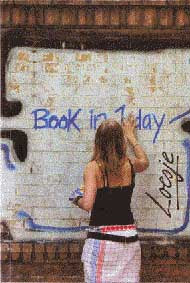 4) Is there copyright on the Loesje texts and signature? On all Loesje texts there is copyright and the Loesje signature is a registered trademark. The reason is to protect Loesje against abuse by commercial companies. Many marketing companies find the texts interesting and if they can they would use and abuse the texts. This happens occasionally and then Loesje sues them. For personal use you can just use the texts without asking prior permission. Under personal use is meant non commercial use for example on your blog or to hang posters at home or at your office. The posters are available online and you can just print them out. If you want to make for example 1 Loesje t-shirt with a text on it for yourself that's fine but if you are going to sell them or use for promotional aims then you have to ask for permission. For any official publication (even if it's non profit) permission should be asked. When granted permission often a donation is being asked to finance Loesje's activities. 5) How do you finance your activities? Somehow this is the most asked question and the answer could be you. As a non profit organisation Loesje depends partly on support from people who visit this website and like the texts. Loesje offers several free services and donations are welcome. Under support and donations you can read more if you feel like supporting Loesje. Besides financing activities through donations Loesje tries to earn her own money by selling products and by giving creative text writing workshops. Another source of income are structural grants though these grants are never for sure since you have to apply every year and in the future Loesje would like to be self sufficient. In 2006 Loesje received support from the European Commission and the Council of Europe because they found the work Loesje does in the voluntary and youth field important. These institutions however do not interfere with Loesje activities and are not responsible for the activities. Loesje is non governmental organisation that makes her own decisions. 6) Why do you sell products as a non profit organisation? Loesje's ideal is to be independent and through the sales of her own products this can happen in the future. All profits go directly in the activities and there is no commercial aim or personal profit. Next to that making your own money feels better than being dependent on insecure state funding and gives you the quarantee that you can do what you want to do without any possible interference. 7) How do you pronounce Loesje? 8) How can I contact other Loesje groups in the world? No, in no case. Loesje is a non-political and non-religious organisation. Loesje does write about politics, religion and issues that are playing in society. 10) How do you write your texts and come with ideas? It's not just Loesje that writes the texts. It can also be you that sends text proposals or ideas. Often people brainstorm either on the www or around a table. Loesje developed a special way in brainstorming and gives creative text writing workshop where the texts are being written. Basically anyone can write Loesje texts but not every texts is a Loesje text. The way Loesje makes texts isn't a secret but it is something that you should experience rather than reading it here on the website. 11) Can I become a member of Loesje? You can become a member/supporter of the foundation Loesje International. Through the webshop you can become a supporter. As a foundation Loesje officially doesn't have members but supporters. As a supporter you will receive Loesje's international bulletin at home, can get products with discount and join the international activities. 12) In how many countries is Loesje active? To be honest that is something Loesje doesn't know. Many people start to write texts and spread posters without contacting Loesje and suddenly Loesje receives photos or mail from places in the world she didn't know people where active. Loesje is active it at least 25 countries in the world and people from around 100 countries visit this website on a monthly base. 13) Is it allowed to spread posters in public? It is allowed to spread posters in public but not on all places. Spreading opinions, ideas and thoughts is freedom of speech and falls under Article 19 of the universal declaration of human rights. However every country has their own rules and regulations towards the spreading of posters in public. It's best to read your local/national laws. Loesje can not be held responsible for any illegal spreading of posters and only offers her posters online for people to access not for illegal actions. Some governments tried to sue Loesje but with no result. Loesje won all court cases based on freedom of speech and the government had to pay the costs of the legal process. 14) I want to cooperate with you? # Trainings/seminars/exchanges (creative text writing workshops). # Awareness campaigns ( development of idealistic pr campaign). # Publications on a certain topic (a theme book with Loesje texts in it). # Projects on a certain theme (for example, xenophobia, human rights).